In our watercolour class, we were challenged to paint a subject where there were 3 obvious points of perspective – 2 sides and the third being either from below or above (worm’s eye or bird’s eye view). 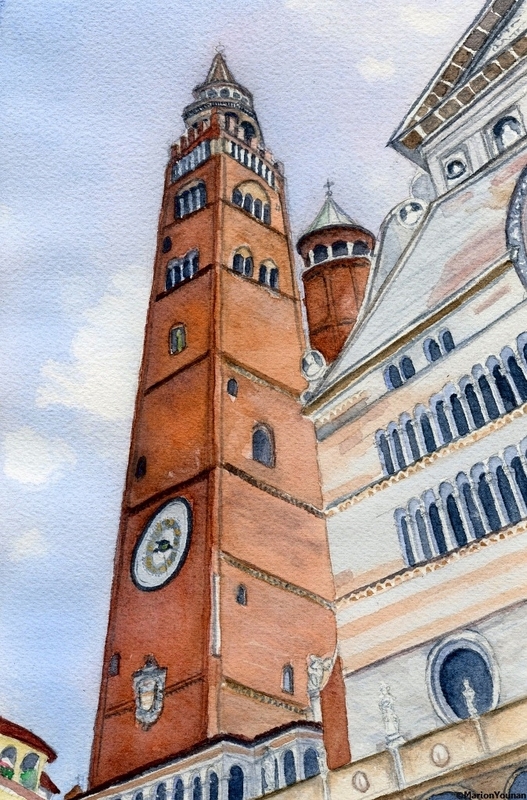 I chose this tower in the city square in Cremona, Italy from a photo I took. From the worm’s eye view looking up, the tower narrows and all the lines converge to a point that would be way up in the sky. This type of perspective certainly played tricks with my brain (more so than usual!) and what my brain was telling me I couldn’t possibly be seeing. It helped to tape this painting to a large drawing board so that I could put the 3rd perspective point above the painting on the board for reference. And I would use my paintbrush to make sure my lines “lined up”. You exceeded the challenge. Beautiful work!